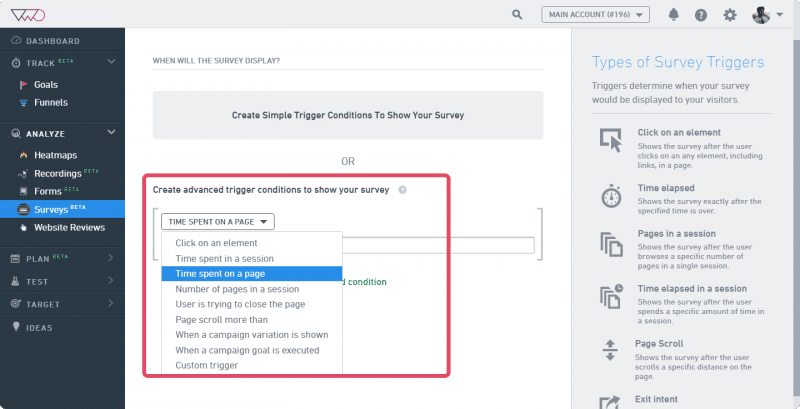 VWO’s On-page Surveys allows you to define a trigger for the survey to pop up. Based on the trigger you specify, VWO displays the survey when your visitor fulfills the trigger conditions. The triggers can be time spent on a page, number of pages browsed, and so on. Selecting this trigger pops up the survey when a visitor spends “x” seconds on a single page. 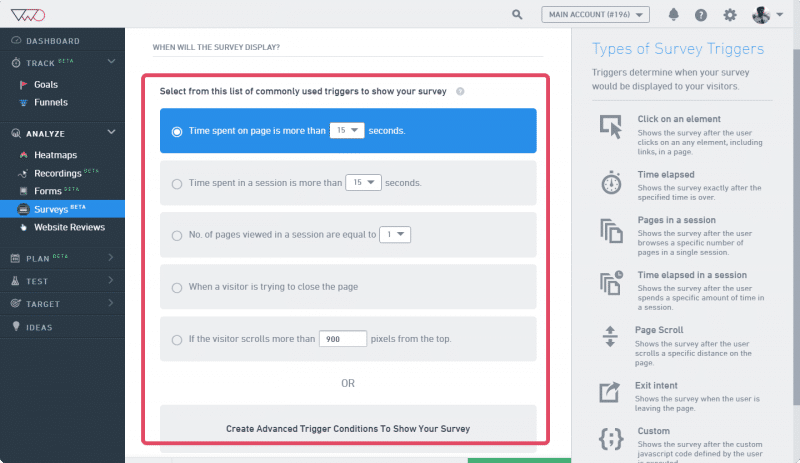 For example, if you have defined the time for trigger as 10 seconds, the survey appears when the visitor spends 10 seconds on a page. ATTENTION If the time spent on a page trigger is set to 0, then the survey displays the moment a page loads. Selecting this trigger pops up the survey when a visitor spends “x” seconds in a session. A VWO session is typically defined as the duration a visitor spends on a website with the VWO smart code installed before closing the browser. For example, consider that your test URL is www.example.com/page1 and you set the session trigger to >60 seconds. Now, if a visitor lands on page1, then browses to page2, and finally comes back to page 1 again, the time spent on these pages is considered toward the final count of time spent in a session. So even the time spent by a visitor on a page which is not part of the test URL is counted as the time spent in a session. ATTENTION A visitor may visit multiple pages in a single session. Displays the survey after a visitor has browsed the specified number of pages in a single session. A VWO session is typically defined as the duration a visitor spends on a website with the VWO smart code installed before closing the browser. For example, consider that the trigger URL is www.example.com/page1 and you have set the trigger to >3 pages in a session. Now, if a visitor goes to page1, then page2, and finally page 1 again, the count of pages in a session is 2, not 3. Currently, it counts all the pages on which any survey is running. ATTENTION VWO considers page refresh as a new page view. There are three different page refresh scenarios considered for this trigger. All the pages in the session were the same page (same page refreshed multiple times), the pages in session were different (different pages browsed), and the pages were a combination of the two (single page refresh as well as browsing of different pages). Displays the survey when a visitor attempts to close the test page. So when the cursor moves outside the browser viewport, VWO executes this trigger. Displays the survey when visitors scroll a certain number of pixels on a page. For example, you can set the trigger when the reader has reached a certain section of your webpage. When this trigger is selected in Advanced Triggers, a few more options are available. A user can choose either pixels scrolled or the percentage page height scrolled from the top or bottom of the page. For a fixed height page, the percentage page height scrolled works because the height is static and doesn’t change. But for dynamic pages where the height is not constant, it is recommended to use pixels scrolled because this would be more accurate and reliable. Example: An e-commerce product search page with infinite scrolling. Also, the reference point for the scroll can be either the top or bottom of the page. The advanced view opens to configure the triggers.By default, a list of commonly used triggers is displayed with limited but most common options selected. If you want more control over the trigger conditions and/or want to setup multiple trigger conditions, click Create Advanced Trigger Conditions To Show Your Survey at the bottom of the page. Displays the survey when visitors clicks a predefined element on a page. If the element happens to be a hyperlink which redirects to another page, the survey would display only if the redirected-to page is also part of the test. Displays the survey when the executeTrigger() function is executed. Users can add their own custom code and call the executeTrigger() function. This way the custom trigger condition is fulfilled and the survey is displayed. Displays the survey when a specific variation is shown. On selecting this trigger, you need to specify Test ID and Variation ID. Displays the survey when a particular variation is shown. On selecting this trigger, you need to specify Test ID and Goal ID.